At Pen Chalet we offer free shipping on all orders over $50* shipped anywhere within the United States. *$50 amount does not include any additional fees such as tax and is calculated after any coupons or discounts have been applied. Standard shipping for orders is US ground service via FedEx, UPS or USPS of Pen Chalet's choosing. Delivery times will vary based on the shipping address location but typically take 2-7 business days to arrive on items in stock. Common questions about domestic shipping? Sorry, we don't offer free shipping outside of the US. International shipments including Canada will incur an additional charge. 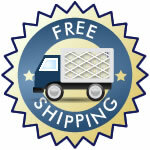 International shipping rates may vary by shipping destination and free shipping does not apply. For international shipping in areas not currently available online please call us or email us for pricing. Shipping prices are determined by location, weight, insurance. Recipients are responsible for all duties and taxes. Common questions about international shipping?